There are numerous things to consider when deciding which hydroponic grow box is right for you. This article will help you become familiar with the different types of hydroponic grow boxes; Including grow rooms, grow tents, and grow closets. By the time you finish reading this article you will be an expert on the different types of hydroponic grow boxes. Hydroponic grow boxes come in many shapes, sizes, and configurations. Grow boxes are somewhat similar to grow closets, however they are usually smaller in size. Grow boxes can be as small as a computer case, as stealthy as a dresser, or even as large as a cabinet. All of our enclosures, including grow boxes, tents, closets, and rooms, come in varying sizes and configurations that can easily match your needs. Grow tents, grow closets, and grow rooms have been growing in popularity as they are an easy and cost effective way to enclose your indoor garden. Although the features, dimensions, and construction materials vary between enclosures, they still accomplish the same goal: To provide a secure and regulable environment to help ensure the success of your plants. A grow tent is a series of plastic or metal supports that are covered with a light proof material. Grow tents are a popular choice among growers who desire a cost effective and easy-to-setup system. 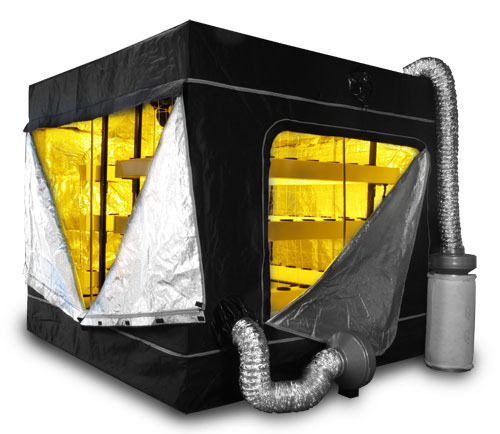 The inside of the grow tent is covered with a reflective material such as Mylar, a plastic material with over 94% reflectivity, or a bright-white plastic. The exterior of the grow tent is often a black or otherwise light absorbent material. Some high quality grow tents will utilize materials that have a middle layer of insulation which lends itself to stealth by deadening sound and preventing thermal leakage. All grow tents feature a door which can be sealed. This is important as it prevents light from leaking in or out, while also helping to maintain negative air pressure. It is important to remember that most grow tents are just an enclosure and do not include lights or other growing equipment. The Oasis 4' x 4' Grow Tent is one of our most popular grow tents. It features a steel frame with adjustable ceiling poles, reinforced corners, and extra large flaps to prevent light leakage. It also has a highly reflective interior which helps your plants reach their maximum potential. Grow closets are similar in size, shape, and capacity to grow tents, while differing in construction materials and features. Grow closets are typically constructed with a steel frame and aluminum walls. The inside of the enclosure is similar to a grow tent in that both are lined with a bright-white plastic or a Mylar-like material. Most grow closets are divided into multiple compartments; One for flowering and one for vegetation. 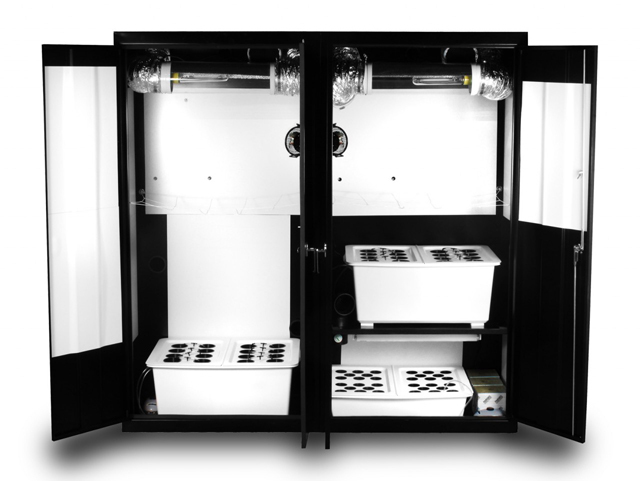 Some grow closets come pre-assembled and include everything you need to start growing. This is advantageous for the new gardener, as it removes some of the guesswork and reduces the initial setup time. The Super Locker 3.0 Grow Closet comes with everything you need to start growing. It includes a 150 watt HPS light, vented reflector housing, Superponics 8 plant system, super mini cloner, industrial grade carbon filter, Technaflora recipe for success nutrients kit, and much more. It also comes with a respectable 3 year warranty and lifetime support. Grow rooms are for the serious grower with space to spare, as most are made with similar materials to grow tents, but on a much larger scale. It is worth mentioning that some of our grow rooms are similar in size to our grow tents, but they are different in that many of our grow rooms come with extra features or products. One of our largest and most popular grow rooms is the Big Budda Box with Grow Room Tent. This product measures a whopping 8’ x 8’ and has a wide array of features including nearly 120 sq ft. of growing space when utilizing the included VERTICALPONICS system. This grow tent also features a sturdy frame, highly reflective interior, and moveable cross members which make customization a breeze. This grow room also features two ventilation ports opposite each other at reflector level. These ports are connected to the CoolTube light system, which prevents heat generated by the lights from venting directly into the grow room. The lights are enclosed in a tube that is connected to a duct which is ventilated outside of the room. This helps to prevent hot spots from building up in your grow room, while also making it easier to regulate the grow rooms environment. There are a few things to consider when deciding which grow box is right for you; The size of the space you have to work with and your budget. If you desire a large garden and have room to spare, then a grow room is the right choice for you. If you are looking for something smaller, around 4’ x 4’ or less, then many options are available for you to choose from, although you may be better off with a grow tent, grow closet, or a grow box. Grow tents are usually cheaper than grow closets, although grow closets tend to be sturdier with more features. The low-budget grower with limited space will be better off with a grow box, while someone with more space and a higher budget will be better off with a grow tent or a grow room. If you have questions about any of our products then feel free to contact us. We are here to answer any questions you may have. Simply head over to our Contact page and drop us a line.